I have enjoyed working again with Richard Wells on this post, despite the 19 hour time difference (which, I guess, is only a five hour one!). If you haven't read our previous post, please check it out: The Habits and Philosophy of an Effective iPad Teacher. I look forward to one day working alongside Richard, perhaps even in person! 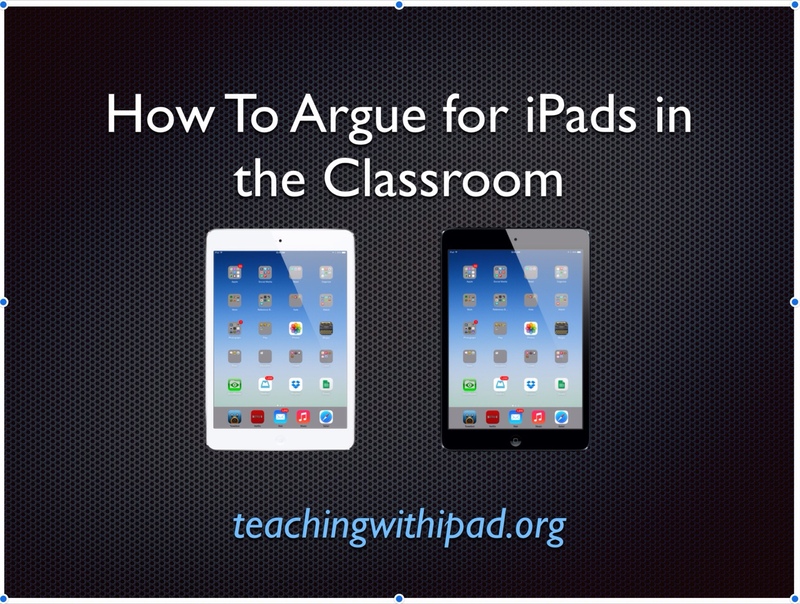 The following post will give reasons and arguments FOR teaching with iPads. We hope it will give you some key justification points in your teaching journey to implementing proper technology (specifically, with iPads) into your everyday teaching. I (Steve) have written in BLUE, while Richard has written in GREEN. a. While it is true that the iPad cannot run intensive programs like Photoshop, laptops can’t be used as cameras or while standing. A modern, active learning environment can be hindered in options by laptops. However, the large majority of common daily tasks (web browsing/word processing/email) can easily be achieved with the iPad. 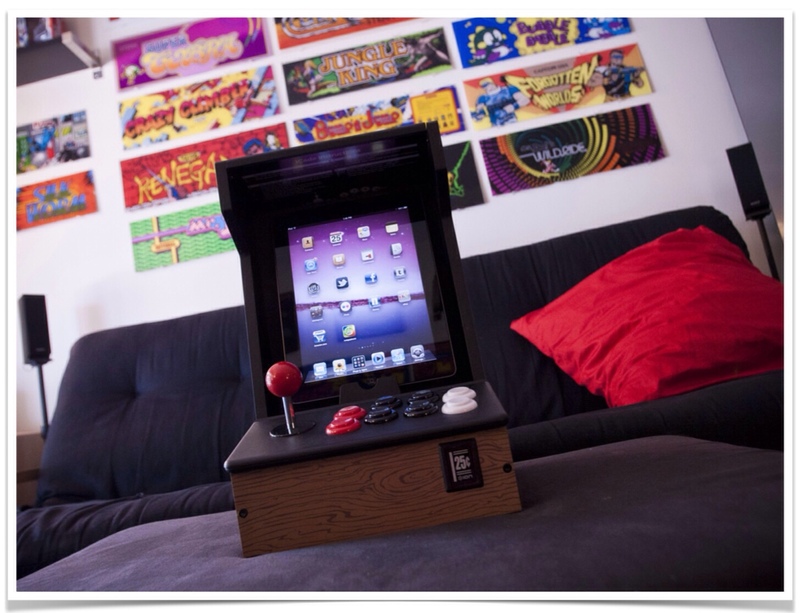 If you don’t need to perform high-end projects, you might find it possible to rely solely on an iPad. The large majority of tasks that I need can be done on my iPad. Having said this, most of us will still need the performance of a PC some time or another. b. The camera is the new pen. People of all ages have started using photos and video to do many tasks they used to do with pens, such as: photographing signs, posters, & whiteboards instead of taking notes. Taking selfies instead of writing postcards; making & editing video instead of writing essays. Laptops cannot be used as cameras and so will find their usefulness in general education decrease over the next decade. a. On the contrary, teachers will both be learning on the go and teaching what they learn. Professional development is paramount in keeping up with the latest trends in teaching, and that is no different when it comes to technology. While there can be review “games” students do on the iPad, they must have an appropriate reason to be utilized in the class. Most students will undoubtedly play plenty of games at home on their own time; they are not meant to be played in class. Instead, the successful iPad teacher is free to work with students one-to-one on the tasks after lesson delivery, and will facilitate the learning much more carefully, negating the need for the students to just ‘play’. b. The 21st Century has given the young person tools and services that offer a power to drive one’s own learning. Teachers nowadays need to consider their role and how much they are developing young people to either rely on them for each step or achieve a deeper learning from discovery, experimentation, collaboration and reflection. I try to design programmes that ensure students are not asking “what do I do next?’ or ‘can you tell me how to do this?’. a. In truth, there actually are apps that allow Flash to be played on an iPad, but the real question is why are certain people making this “issue” their argument against iPads? This may have been a strong argument back in 2010-2011, but these days, websites have adapted to suit the iPad. I rarely encounter websites that require Flash, and when I do, I just move on to a more updated one. HTML5, which plays just fine on iPads, has more or less replaced Flash in the modern Internet, and is a very suitable alternative. b. Most computing and business these days is mobile & personalized. 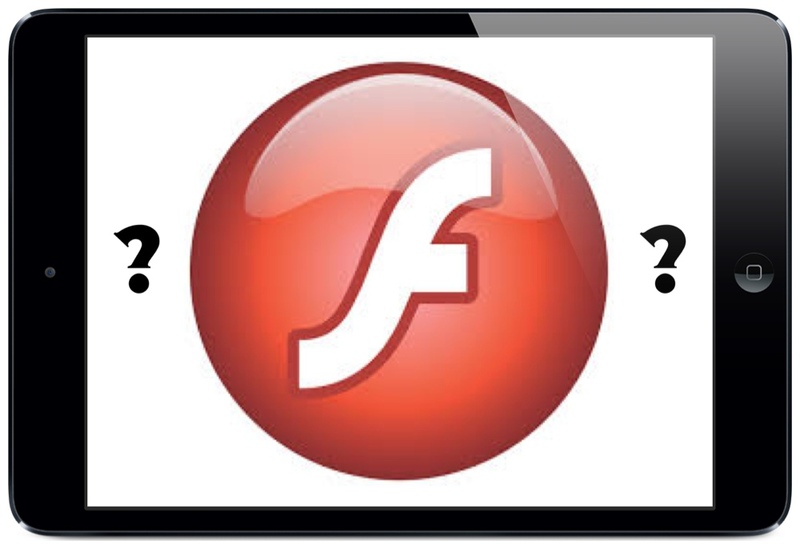 Adobe themselves have stopped developing Flash for all mobile devices to focus on HTML5. It is important to future proof your courses, and therefore reliance on Flash is risky. More importantly, it should be the students who are offered the freedom to experience learning in a more personal way. My students often show me newer tools, sites and apps that do the same job better. A. In groups of two or three, students have shown tremendous ability to work together on iPad projects. In my experiences, they have no qualms about sharing the actual iPad use, and, in fact, teach one another very successfully. Even in a one-to-one setting, students are willing to help each other when needed. When projects are completed, they are very excited to share them with the rest of their classes. b. Active learning increases the need for teamwork. 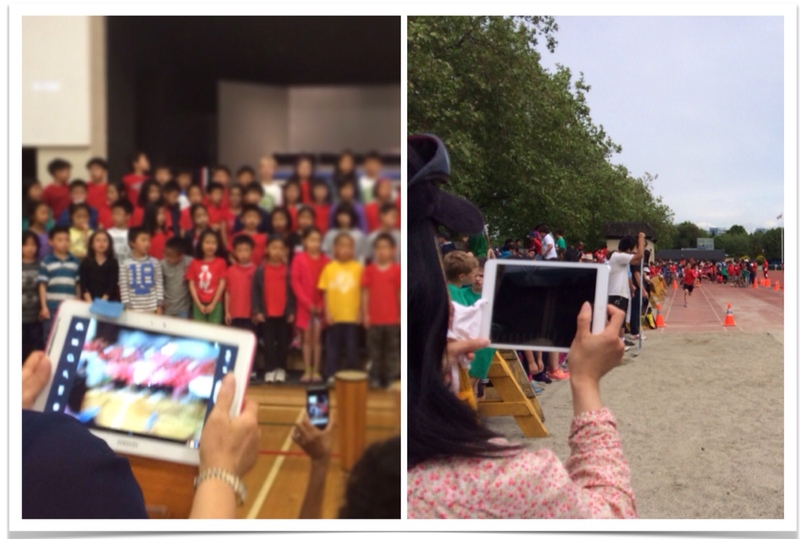 The iPad offers opportunity for student driven learning and thus increases the amount of communication between peers as they create material and connect to learning outside the classroom too. a. USB drives came in very handy a few years ago. They replaced the disk, and could fit much more storage. 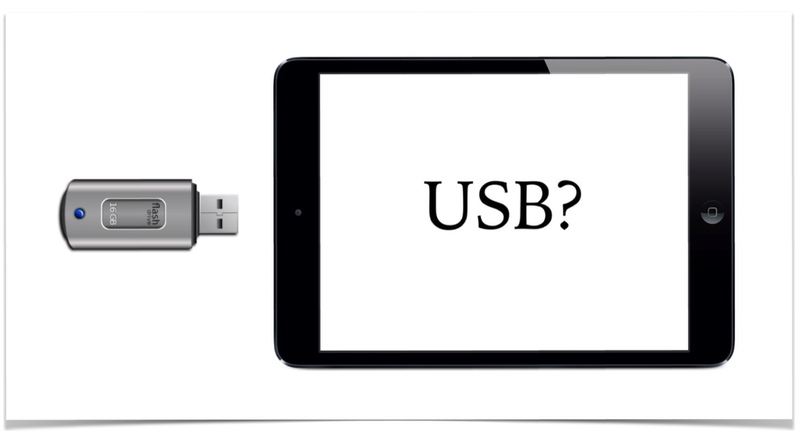 Students would hand in their assignments via USB. It was, needless to say, tedious to keep track of all of them! Nowadays, Cloud storage of files replaces USB drives. Using Google Drive, saves are instantly made, so students don’t need to worry about using (and losing) their USB keys. Another cloud storage solution that have become very popular is Dropbox. In fact, most productivity apps will already have Dropbox integration. With online storage, you never need to worry about losing that USB key. Need to transfer a file from one device to another? AirDrop is also a relatively new and easy way to do so. a. Almost all new printers have wireless (AirPrint and WiFi) printing. Most printers are affordable, some costing as little as $30. No, your laserjet printer from 2005 won't be able to print off your iPad, but the next printer that you (or your school) purchase(s) will. Having said this, printing has become less of a necessity, as intelligent educators would rather have electronic copies instead of piles of paper. b. There are many free tools and services that allow students to publish their digital work online. Thousands of schools are asking students to blog their school work and reflections. This publishing is important for a number a reasons and can negate the need to print. Teachers, parents and peers can comment on the work and I have my students offering praise and assistance. This more personal approach to feedback can also increase engagement. Paper still has an important role to play in education for a number of creative reasons but the one of them is not to duplicate the work from an iPad. a. Apps cost a fraction of what we used to pay for computer software. We understand that teachers don’t particularly like to spend their own money on apps since they do purchase a lot for their classrooms already. However, with proper research through online networking and word of mouth, teachers can purchase only the apps that are deem worthwhile. Most apps will cost less than your average latte at Starbucks. Before purchasing, say, a $10 app, talk to people who have used it, or read several reviews of that app in the App Store. b. All the essentials for a modern learning environment can be found for free. 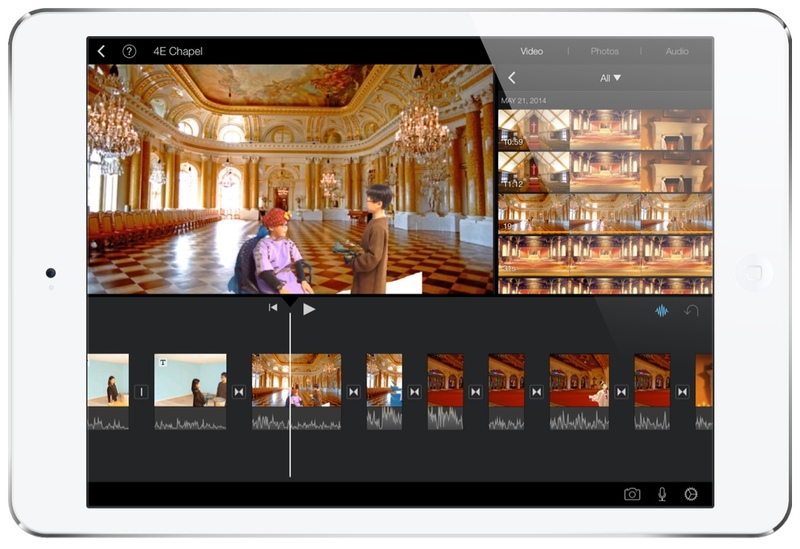 Students can film, edit, draw, write, publish, record, and share for free. Let the students do the work of discovering the best free tools and make that an important part of their learning – they’ll need it for the rest of their lives! a. 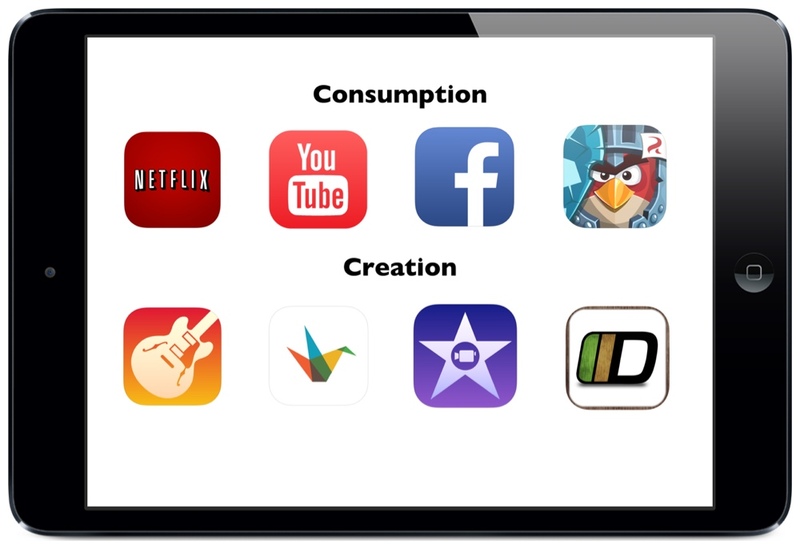 While the common use for the public for iPads is definitely for consumption purposes, there is an ever-increasing amount of creation-type apps for iPad. The possibilities are literally endless using apps such as Garageband, iMovie, Sock Puppets and Explain Everything. It is amazing to see students use their imagination to create projects beyond our expectations. The large majority of iPad owners will use their devices almost solely for consumption, but with proper professional development and encouragement, educators can unleash a sky’s-the-limit approach to what can be created with the iPad. b. Adults are often happy just consuming information but young people soon get bored. From Minecraft to Green-Screen filming, my students much prefer making things to express what they’ve understood from the teacher, research and each other. Creation vs. Consumption: Which iPad user are you? b. Learning is not something that gets delivered. iPads, particularly in a 1-to-1 environment, allow a teacher to work with the students whilst they create their own approach to learning content and skills for life. a. Well, actually, yes there (finally) is, as of March 2014. The caveat is that you need a Microsoft 365 subscription to be able to edit documents. Some schools may offer their teachers subscriptions, while other teachers will need to decide whether or not the $99 annual fee is worth it. If they are already current 365 subscribers for their PCs at home, then using Office on the iPad will not cost anything extra. 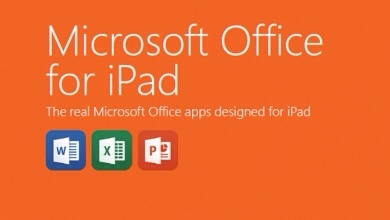 There are also apps of MS Office “suites” that you can edit all your MS Office files, such as Quickoffice and Polaris Office. Finally, Apple’s own iWork suite is now free for all new devices, and is a viable and more affordable alternative. a. My students are a prime example of how the above statement is not true. I teach students in an elementary school with a set of 16 iPads, and I have been impressed at the work that has been done with them. With proper instruction, students are eager to not only master the basics of what is taught, but also to go ahead and strive to exceed teachers’ expectations. This could be from the fact that the large majority of my students will have at least one iPad in the family already. But with the intuitiveness of age-appropriate apps, most students do not have difficulty with doing at least what is expected of them. If you've made it to the end of this post, thank you! 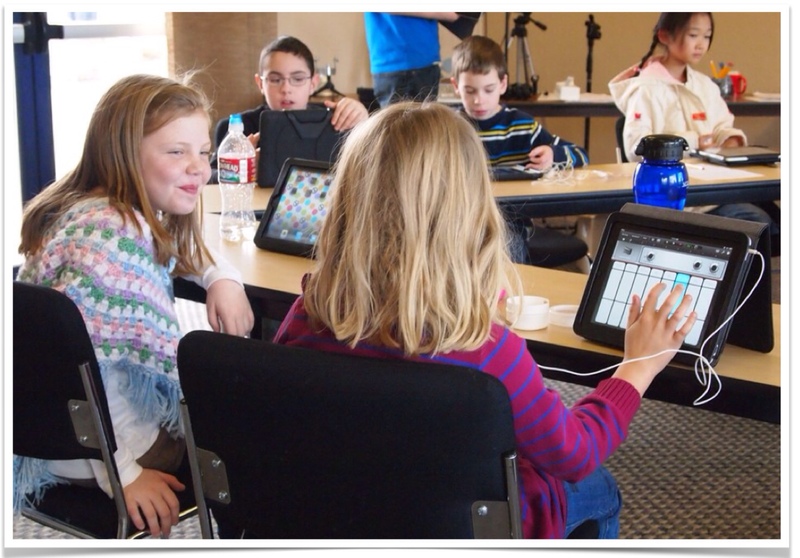 We hope that you have picked up a few pointers on implementing proper iPad instruction in the classroom. Again, it is with effective teachers that will make this work. You cannot just hand an iPad to someone and expect them to become successful. There needs to be a good understanding of what content you want to teach, how to teach it, and how to use technology to do so. It does take tremendous practice to do it well. Having said that, there also needs to be a sense of excitement and an understanding that all will not go perfectly. With proper education, professional development, a positive outlook and a willingness to learn, we can all become better teachers! Did you like this post? Please share it with your colleagues! 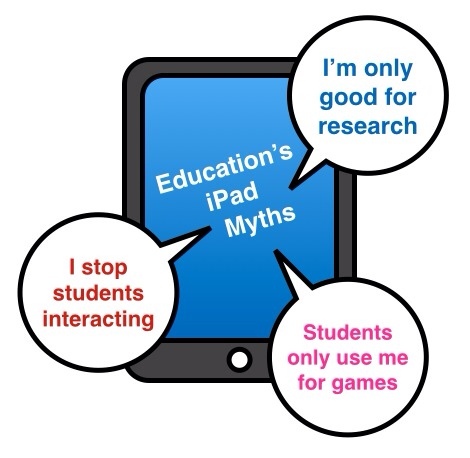 Check out Richard's blog: ipad4schools.org. He has many incredible infographics that you can use! Follow Richard and Steve on Twitter. Pretty much sums up every argument people have used with me! Thanks! Great post. I was checking continuously this weblog andd I am impressed! Thanks and bes of luck. and additional material, is there any other web site which gives such things in quality? I would like to weigh in on the discussion here about the iPad in the classroom from a parent’s perspective. My two older children have iPads, there are many things that are great about the iPad, emailing assignments directly to the teachers, having all the notes and study guides in one place and great and amazing apps to help them learn. But with the iPad brings a whole new animal into the arena that the above article is not addressing. It takes my children twice as long to do their assignments by iPad because of all the built in distractions these devices offer, also an inability to think for themselves, in taking their own handwritten notes, synthesizing information, understanding ‘big picture’ ideas. Everything is offered right to them, they don’t have to know how to look for information other than what pops up on google or safari. I appreciate the project work, or the fun videos they make in language class, but I would rather them learn written content editing rather than how do I make a video. I know this is the wave of the future and schools look progressive to have a fully integrated iPad program at their school. But I think it’s not all it’s cracked up to be and that we may not find that out until much later. A compromise might be to incorporate a little bit of offline work–homework perhaps. But be warned it may be all the great things mentioned in the article above, but it’s potential for other, negative things is there as well. IPads in the classroom come at a cost, (and I don’t mean monetarily) to your child and your family. Thanks Ann for your thoughtful comments!